All Hands On Deck – Draw cards. Steal ships. Talk like a pirate. 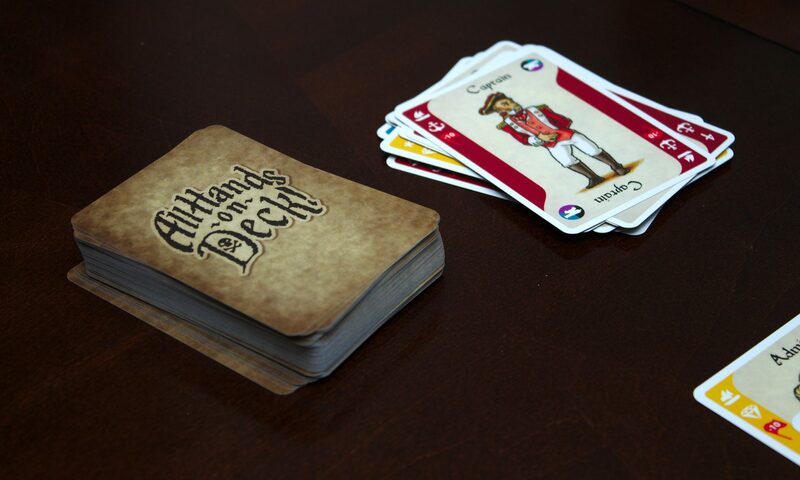 All Hands on Deck is a pirate themed deck-building game where players assemble crews of privateers or naval officers and face off against each other in epic battles on the (tabletop) ocean. Build your first ship by laying down a shipmaster card with three crew cards of the same suit. Strengthen your crews with treasure, The Black Spot, or by building a Prize Crew. If the player discards a card, you may shout out “argh” to claim the card for your draw. If you argh, you don’t draw. No argh-backs. Each player takes a turn. When a player completes three ships, each other player takes one additional turn. The first player with three ships uses their ships to overpower other ships crews and steal their ship. The three crew members fight individual battles in order. The crew member with the higher fighting value wins. Whoever wins the most crew member battles wins the ship and any treasure on board. Watch out for Prize Crews and The Black Spot! Each additional player chooses whether to attack with their own ships, one at a time. Tally your point totals for each ship and treasure card and play another round. The first player to 500 points wins. Crowdfunding campaign coming soon! Join our mailing list to get on board.